Luftwaffenkommando West reported that two Rotten from “Kommando Kaatsch” had successfully seen through their respective missions at midday and late in the afternoon. There were a company of US troops with about 50 cars and trucks in the village of Mollans; individual vehicles on the Lure – Vesoul road. More immediately threatening perhaps were 20 Shermans near Plancher-les-Mines, two of them on fire, while another 10 tanks approaching from the west. Twenty vehicles were heading north from Villersexel to Lure, and there were four stationary tanks. Fighting was in progress between Ronchamp and Belfort, “5 km south of the railway tunnel” with shells bursting, houses on fire and two Austers overhead. NOTE: The actions observed involved the 1st Free French Division. As reported by ULTRA, a Rotte from Sonderstaffel Kaatsch (so-called in the report) had been forced to break off its reconnaissance of roads in the Belfort–Lure area of Eastern France, 10 km. east of Vesoul, following mechanical failure in the leader's Messerschmitt. The mission had lasted from 15.10–15.56 hrs. (local time) and according to a British Intelligence report an Auster had been fired on and forced to land. (The day before, a Bf 109 of 1./NAG 13 had engaged an Auster without result near Nomeny, 12.5 km east of Pont-à-Mousson). NOTE: According to a British Intelligence report, an Auster had been fired on and forced to land but this may be the action which Lw.Kdo. West’s diary places on the 29th (see below). 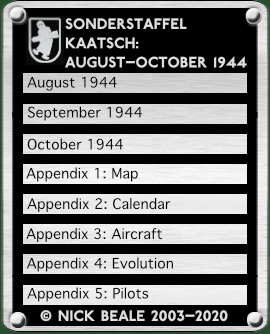 The disbandment saga took another turn when Luftflotte 3 again directed FAG 123 to withdraw Kaatsch from operations and disband it when 2./NAG 13 arrived in Freiburg (the previous day, Luftflotte 3 had advised subordinate units that Donaueschingen was available as a base for this Staffel). According to Lw.Kdo. West, Kaatsch had dispatched two Bf 109 Rotten at midday, in support of Nineteenth Army but both had were forced break off prematurely and without results owing to “air combat”. An Auster encountered over the target area had been forced to land, strafed and set on fire. On the road between Saint-Amé and Saint-Loup-sur-Semouse, 125–160 vehicles. Heavy vehicle traffic and parked vehicles in Remiremont. About 10 tanks parked north of the road from there to Plombières-les-Bains. Luxeuil airfield occupied by six Thunderbolts and a transport aircraft, taxiways undamaged. Around 25–30 vehicles, apparently transporting ammunition, running a shuttle service on the Mélisey – Servance road. Ten lorries parked in Villersexel. Heading north from Baume-les-Dames, a column of 60–80 vehicles (heavy multi-axle lorries). In Passavant and on individual farmsteads, 100–150 vehicles and troops spotted. Reconnaissance results confirm the long-observed enemy’s point of concentration in front of the Nineteenth Army.